Unfortunately, summer in Chicago has come and gone (so quickly!)! Now we are feeling the cooler weather and leaves fall, that just means winter is coming, and it will be here longer than we want. Usually people try to escape Chicago winters and go somewhere warm since as we all know, our winters last an eternity. Sometimes with our schedules, we cannot escape Chicago, so in this post I am going to help you identify ways that you can get out of the winter blues and feel better. Being able to recognize when you are not feeling well and when your mood is changing. If you are feeling more fatigued, low energy, lack of interest in things that you normally enjoy, sleeping too much, not able to focus, etc, then things might be a little different. The key is trying to identify it and seek support/utilize coping skills before it comes! During winter, we Chicagoans tend to stay inside more due to it being too cold to be outside. We normally are only outside when we are walking to or from the train or bus and to run a few errands. We tend to be in the car more or inside of our homes or offices. Sunlight is good for the body and mind and trying to get more light is necessary. Trying to find a place that has natural sunlight is key and trimming hedges/trees around your home can be beneficial too. With daylight savings, we have more daylight during the morning hours. Trying to get up an earlier to get more sunlight can be advantageous for your mood. Mornings cause us to set a precedent of how we want our day to be too. When feeling in a rut, we tend to just let things go out of the window and we do not set routines for ourselves. Really allowing yourself to stick to a routine that you know is helpful for you is key. Making sure that you are still doing what you need for yourself daily is necessary to not allow you to slip into the winter blues. With fall here and winter approaching quickly, we tend to pack on some weight, since we are not walking around anymore and not being as active. We tend to sit more at home and eat “comfort food” along with all the holidays. Making sure that you are still eating healthy and trying to cook for yourself can help you not get the winter blues. Low carbs, high protein with legumes are very healthy for the body and mind. In previous posts, I have emphasized how much exercise and meditation is key for your health and mind. Trying to get some exercise during the winter months can help your mind and keep your brain more active. Even going for a 20 minute walk on the treadmill or a quick jog. Doing yoga and meditation is key for maintaining feeling good. Doing some sort of exercise that you enjoy can change how you feel. I am a huge proponent on self-care and I have noticed that it is the first thing that goes out of the window, when we are stressed, busy, or not feeling well. Making sure that you are taking care of yourself during times of winter blues is vital. Taking a bath, getting pampered, baking, going to the movies, reading, whatever makes you happy. 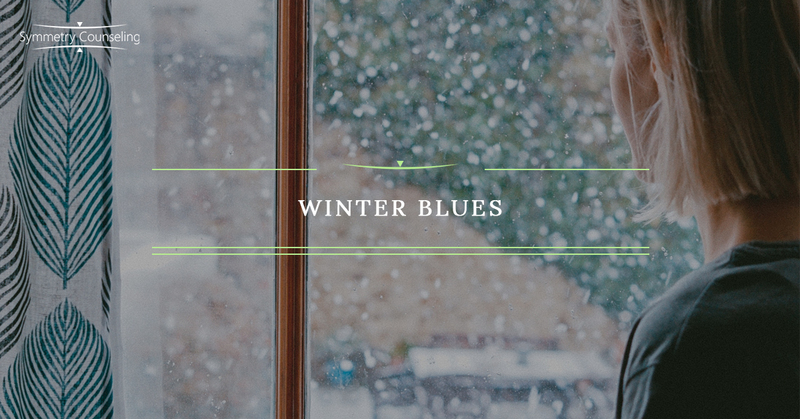 Feel free to contact any of our highly trained therapists if you feel like you are entering the Winter Blues and need help coping with them. Remember that you are not alone, and we are here to help support you through this time.